Once I decided to get into leatherworking, I ordered a beautiful side of leather that was light brown in color and had a smooth texture. To learn how to make a tote bag, I watched several videos on YouTube and found some people who provided an in depth tutorial. Following the steps from these YouTubers, I started by sketching a simple leather design in my small notebook. Then, I sketched an elevation of one side of the bag at full scale. Using the full scale sketch of the tote bag, I drew all of the parts and pieces that would come together to make the tote bag. The drawings for each piece was transferred to double ply chipboard, which were all cut and formed into templates for the bag. These templates were placed on the leather side and traced using a scratch awl. Then, the pieces were cut out of the leather and organized for the next step. For my first bag, I used some leather cement glue to bond the leather pieces together and to form a curved lip at the top of the bag. This was the most challenging part of making my first leather tote bag because the curved lip required two pieces of wood and three clamps to hold the leather together. All of my future bags do not use glue. Once the glue dried, I drew a line offset from the corner of the bag by about ¼ inch. Using a leatherworking mallet and 5-hole punch tool, I made holes that were evenly spaced for sewing the leather pieces together. When the holes were made, I took two needles with waxed thread and began the cross weaving process. At first, this took a little while to understand because it’s not as simple as putting the needles through the hole and pulling them taught. I needed to put the needles through the hole in a specific way so that the stitches would come out straight and uniform. 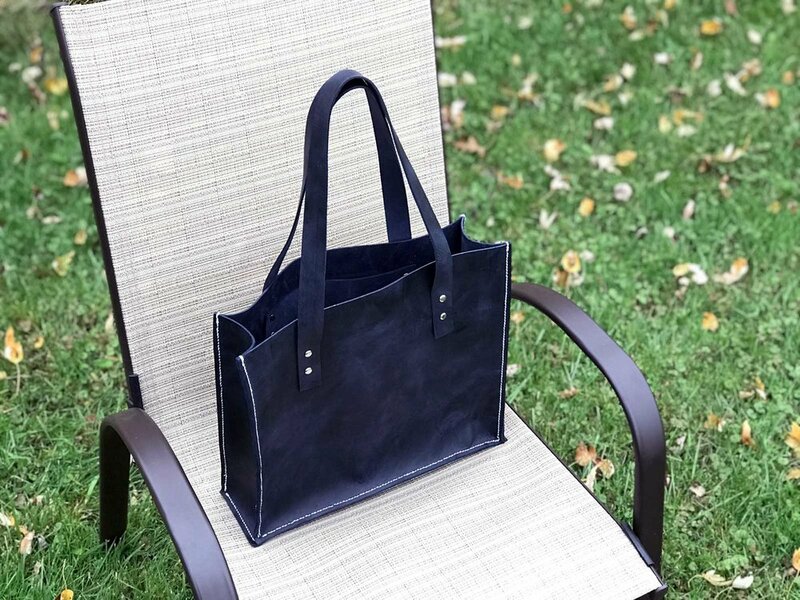 Lastly, the most exciting part of making a leather tote bag is at the end of the process when the handles are on and the stitching is complete. Since tote bags are made inside out, you need to reach your arm into the leather bag, grab the bottom, and slowly pull the leather inside out so that the exterior face of the bag is on the outside. With some experience, I decided to try making the tote bag again, however, I decided that I wanted the stitching on the side of the bag to be visible. Therefore, I needed to stitch the bag together without turning it inside out and overlap the edges so that the stitches would be visible and the bag wouldn’t thin out at both ends. 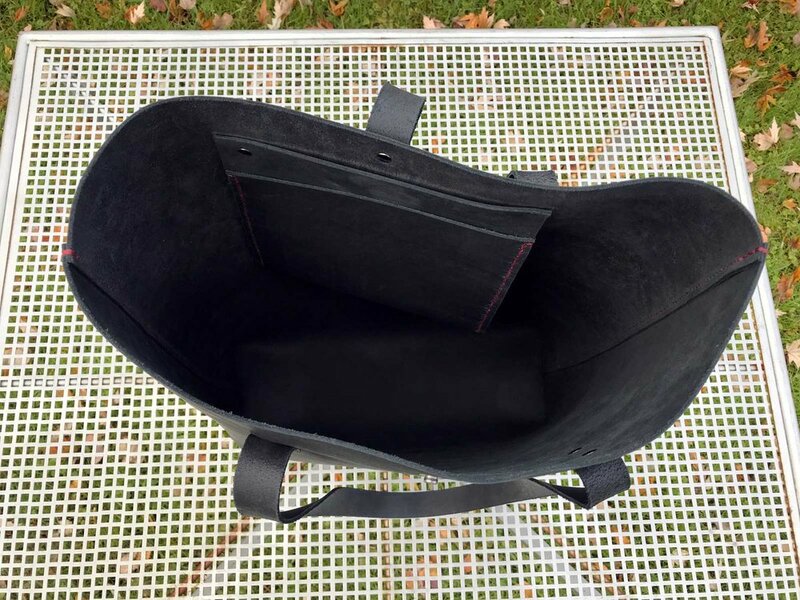 Although I love the final outcome of the bag, I think the red stitching at the base of the bag should’ve been turned inside out so that only the vertical stitching would be visible and the bottom corners of the bag would be inverted. My newfound hobby of leatherworking has quickly become a part of my life where I’m constantly thinking of new ideas and designs that I want to try. It is also helping my process of designing architecture by reminding me that the process, repetition, and practice in design is the most important part of developing a beautiful final outcome. So far, leatherworking has taught me that I believe in simplicity in design where every element should have a purpose. I hope this hobby will continue teaching me more about myself as a designer and I’m looking forward to making more products!